Monday we were “weather-ed out.” Today we were able to resume dive activities on the Tulsamerican site. The ROV continued its work, this time on the deeper section. The deeper section is primarily the aft portion of the B-24’s fuselage, starting just behind the wing near the ball turret. 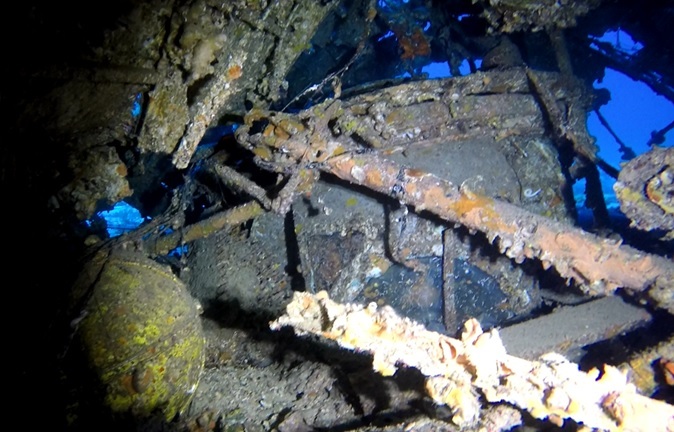 The aft section also has a large debris field around it, with oxygen bottles, vertical stabilizers and other detritus surrounding the large remaining structure. 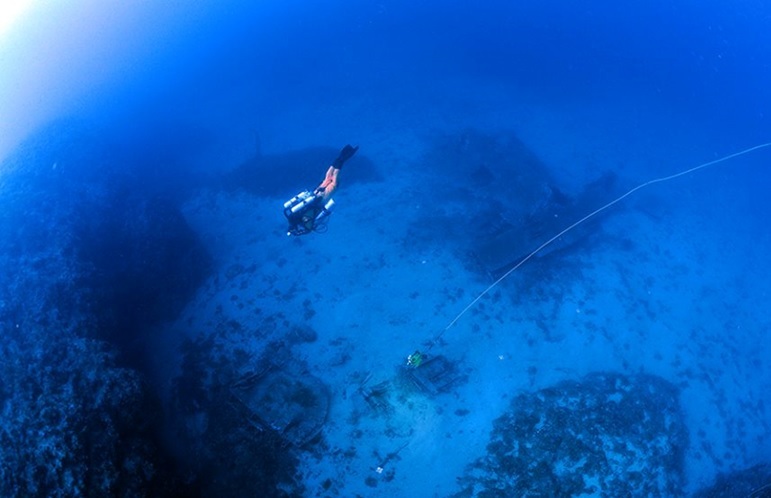 The ROV “mowed the lawn” back and forth across the deep section, tying together not only the main part of the wreck but including the debris field as well. Two divers, Andreas and Gabrijel, were able to focus their time on the deep section to obtain GoPro footage of the interior of the aft portion of the fuselage. This footage will allow the 3D model to include the remaining interior spaces of the wreck, and was likely some of the first footage obtained of its interior since its discovery in 2010. Two photos are attached below. The first is a still from GoPro footage filmed by Andreas by reaching into the fuselage through the starboard waist gunner’s window and looking forward. Visible is the ball turret still in its mount; the large circular window was the ball gunner’s primary view of attacking fighters. The second photo was taken by Danijel Frka, and is an overhead view of the deep section. Andres and the ROV are inspecting the port side vertical stabilizer. Visible in the upper right portion of the photo is the aft fuselage and tail of the Tulsamerican.